We at InterBering believe that the Bering Strait tunnel can be built through private financing without the financial help of central governments. Besides completing the tunnel itself, for the United States, Canada and Russia roughly 4,000 miles of new conventional railroads would need to be built, at an estimated total cost of perhaps $90 to $120 billion. 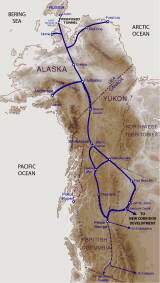 And with the support of international investors, and approval by local territorial governments if not those in Washington, Ottawa, and Moscow sufficient financing could be found to connect the railroads from both continents through the tunnel which would build either in advance, or after completing the railroad from Fairbanks to Cape Prince of Wales in Alaska . In reality, the planning, construction and utilization of the tunnel across the Bering Strait will be launched only after much preparation by those with enlightened economic vision - and by private investors prepared to recognize opportunity and grasp it. Progressing step by step, we intend to first establish an office in Anchorage, Alaska or another city where local governments, construction concerns and finance groups can work together to achieve the higher level of communication necessary. Over time the value of the company will likely grow, as will the value of any investment per the ownership percentage secured on the day of investment. The profit potential for InterBering is exciting on several levels. 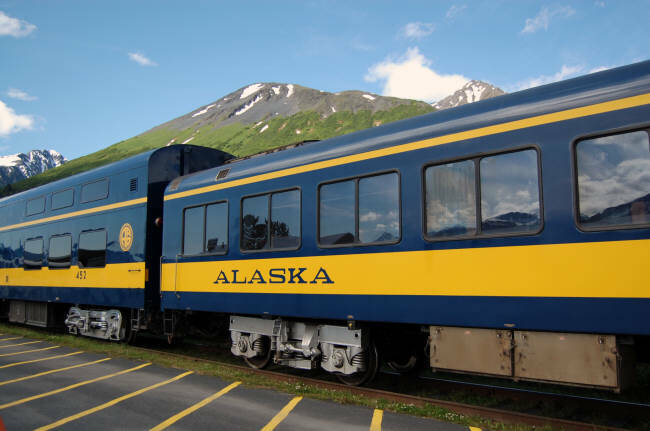 To begin with, revenue streams created by any new rail link connecting the existing North American railroads with destinations further north in Canada and Alaska, and with existing railroads in China and Russia further to the North to Chukotka Peninsula could be sizable. This will fully mature over a period of 10-15 years, as commercial trains deliver cargo and passengers north and also back to the lower forty-eight states. Any investment now should steadily grow in value along with the marketplace's recognition of the project's full potential. Also to be considered is that by forming a Limited Liability Company, investors getting in on the ground floor stand to greatly profit should InterBering later become a publicly traded company. With an ultimate stock value possibly in the hundreds of billions of dollars - every initial one share (unit) of $1,000 might yield much more. Building our own office, getting permits from federal and state agencies, starting environmental and surveying studies all will, of course, move forward our project and its profit potential. Opportunities to invest in the InterBering available now, after we have formally established ourselves as Limited Liabilty Company as of October 1st, 2013 and has begun accepting investments from the public. You are cordially invited to become a member-investor and to benefit financially from what promises to be the monumental infrastructure achievement of a new era in global trade. Please read all the information contained below and consider becoming an investor. This is truly your chance to get in on the ground floor of the era's most exciting investment opportunity. The growing assests and holdings from private investors with InterBering Corporation will greatly assist our project negotiations at both the local and international levels. Meanwhile, technical aspects of project planning continue and securing of all the necessary agreements and permissions will follow. 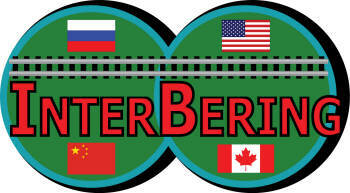 Railroad transportation company InterBering, LLC, organized in the state of Alaska as a Limited Liability Company (hereafter "the LLC"), is an intermediary organization interested in the construction and operation of a Bering Tunnel and U.S.-Canada-Russia feeder railways. The LLC's initial goals are to accumulate, along with other members of the LLC, initial investment capital amounting to the sufficient sum required for registration InterBering as a corporation. The final determination will be decided by the Board of Directors of Corporation. Once this goal is reached, and full business operations commence, the second phase of the project - converting the LLC into an open public corporation - will commence, with corporation shares issued and traded on a major U.S. stock exchange. ● Standard (conventional) two-lane railway lines for regular freight and passenger traffic extend into both continents (North America and Eurasia), connecting to existing rail lines - especially from the terminal sites of Fort Nelson in Canada or other starting point, and Yakutsk in Russia, with multiple railway stations accommodating the development of neigboring regions, and the Bering Strait Tunnel, at the cost of US $145 billion dollars. ● Highways running parallel to the new transport corridors serving initially to assist in the organization of construction work, especially in the vicinities of Fairbanks and Wales (Alaska), and Yakutsk and Uelen (Russia), at the cost of US up to $15 billion. ● Land acquisition when necessary, at the cost up to US $10 billion. ● Energy Facility Construction, at the cost up to US $ 30 billion. 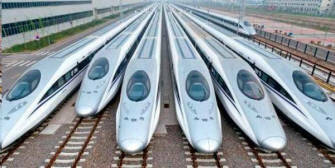 ● Acquisition of Rolling Stock, at the cost up to US $15 billion. To become a member of InterBering, LLC an individual can be a U.S. citizen or foreign national interested in making a significant contribution toward connecting the railway systems of North America and Asia, or represent the private company, LLC, corporation, governmental institution, mutual fund, non-profit organization, or any other entity except the terroristic organization, a member of terroristic organization, a person or organization under US government sanctions, and is a subject of approval by the Director of InterBering, LLC. Membership in the LLC is free, beyond a capital investment which in turn is expected to provide members with significant income after the formation of a public corporation and sale of shares on a major U.S. stock exchange. Members of InterBering, LLC will be rewarded for their early initiative with shares of the corporation at a proportion ratio per each one unit in invested capital to the InterBering, LLC. The minimum investment in InterBering, LLC is US $1,000.00 (1 unit.) The maximum investment amount is limited to US $50,000,000.00 (50,000 units.). Total amount of units issued by InterBering, LLC is 500,000. Request must be accompanied with membership application and purchasing required amount of units of InterBering, LLC. Fundraising is carried out mainly through bank transfers, and in the U.S. as well with cashiers' checks. Purchase with payment by credit card is also acceptable. Upon decision by the Board of Directors to form a Corporation, acceptance of further funds will stop and InterBering, LLC will be re-registered as a corporation with sale of its shares on a major U.S. stock exchange. At the same time, members of the LLC will receive shares in the new corporation, InterBering, Inc. These shares can be sold immediately or retained in anticipation of rising value. Accountability of investment before formation of the corporation InterBering, Inc.
During the period preceding the goal of reaching nessessary capital accumulation InterBering, LLC intends to utilize some of its money for office and representational expenses, and promotion of the project. Costs associated with signing treaties, conducting surveys, design work on the first section of construction of highway and railroad lines between contagious USA, the cities of Fairbanks, Anchorage, and Wales, Alaska, and other project related expenses are also anticipated. What is the purpose of payment of high dividends to initial investors? A monumental project such as construction of a railroad linking North America and Eurasia by undersea tunnel makes necessary an innovative approach to securing initial funding. With the likelihood of an eventual ultra-high rate of investment return - which could result in one million dollars of investment ultimately yielding as much as one billion dollars in shares - we feel the goal of gathering an initial capital is made more attainable. All required information about individual investors must be included in their application to become members of InterBering, LLC. Prospective applicants should go to http://interbering.com/InterBering-member-application/InterBering-LLC-Membership-Application.pdf to print out the application form. Investors should retain a copy of their signed application for their own records. The certificate of membership indicating amount of units and the name of investor (as shown above) will be mailed to investor after completion of purchase. 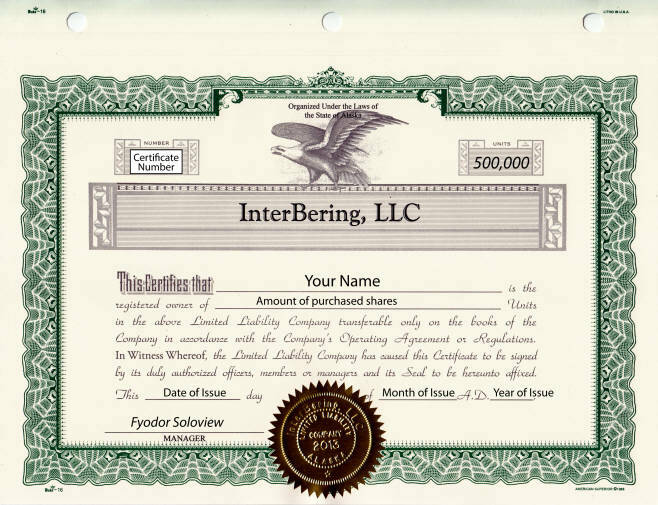 InterBering, LLC Certificate of Ownership. To get it, click here and apply.